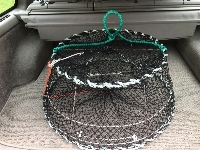 Before I wrecked my back I bought two of these prawn traps, but have decided to just go with one. This one has never been in the water. 30" S.S. frame round commercial style. S.S. entry openings. 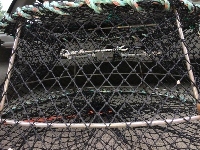 Heavy commercial weight tar coated net. Polysteel bumpering rope top and bottom. U.V. resistant shock cords instead of rubber bands. Highest quality trap on the market and made in Canada.